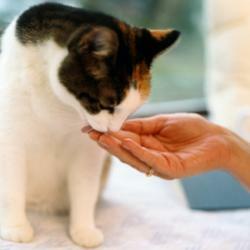 Your kitty may never take first place in an obedience competition, but teach your cat to come when called. All you have to do is figure out what she finds irresistible and follow a simple training plan. It's usually best to begin training when a cat is still young and impressionable, but you can train an adult cat. You just need to be a little more persistent and patient. For most cats, food is a big motivator. However, the food you use to entice your cat to come to you should be tastier than the typical piece of dry cat food or bit of canned cat food. Tasty treats like bits of tuna, chicken, hotdog, or commercial treats your cat loves are the best foods to use. Keep in mind that you can use more than one kind of treat to keep things interesting for your pet, but it's best to reserve these treats strictly for when you call your cat. Select the words you will only use when you call your cat to come. Although you can include her name when you call her, it may be best not to since you're bound to use it at other times in other contexts. Consider using come here or treat time or another simple phrase that comes naturally to you. You might also consider using a clicker or a whistle to call your pet. When using food rewards for training, it's best to train your cat when she is hungry. If you normally feed her in the morning, plan to hold a five-minute training session before you give her a full meal. With your cat just a short distance from you, ask her to "come here" or use your chosen signal, and then hold out a tasty little morsel. If she doesn't want to eat from your hand, drop the treat on the ground and let her eat it. Take a step back from her, repeat your call to come, and offer her another nibble. Do this a few times to condition her to the fact that coming to your call/signal results in a reward. Take two steps back from her, call her again using whichever phrase or signal you chose, and offer another small treat. Repeat this process three or four more times during the first training session. Ideally she will quickly associate being called with being fed something delicious. Stick with calling her from a couple steps away until she responds reliably. After the training session is over, go ahead and give her the rest of her meal. Once your cat comes to you from close range, it's time to expand the distance between the two of you. Try calling her from about four steps away, and work in an extra step away each time she responds reliably at the previous distance. You should eventually get her to come to from the other side of the room whenever you call her. Once your cat will come to you from across the room, try calling her from the next room and always reward her for each successful response. Finally, try calling her from anywhere in the house and reward her when she comes. Keep these tips in mind as you train your pet. They can help you troubleshoot problems as they come up. Begin training indoors at first. You can expand to training outdoors only if you already allow her to spend time outdoors and only after she learns to come when called indoors. You want at least some assurance she'll come to you rather than dart off into the neighborhood. Watch out for treat boredom. If you cat stops responding to your call, substitute another tasty treat to see if that helps and plan to rotate the treats you offer. Limit training sessions to no more than five to ten minutes tops. That way you can keep training sessions fresh. Coming to you should always be pleasant. According to information published at vetSTREET, go find your cat without calling her if you intend to take her to the vet, trim her nails, or perform some other task she doesn't care for. If she suddenly fails to come when called, go back to the previous distance she reliably came from and work from there to reinforce the training. You can then try progressing to greater distances again. Always end the training session with a successful response from your pet. Always try to offer your cat some kind of treat when called. It's a rare cat that will respond automatically just to your call. She may go back to ignoring you completely if you don't make it worth her effort. Don't get frustrated with your cat, or she'll probably ignore you and walk away. Keep your mood light and encouraging, and you're bound to get a better response from her. Training your cat to come when called is more than a convenience; it's an important part of keeping her safe. If there's ever some kind of emergency or she becomes lost, responding to your call might save her life. Think of the time you spend training her as an investment in her care that's well worth the effort.